Preservation Pottstown is a non-profit group that undertakes a host of activities to support and celebrate what’s awesome about Pottstown. One of their premier events is the Patriotic 5K Run, which will take place this year on Saturday, July 3rd. Parking is at The Hill School‘s Center for the Arts at Beech & Sheridan Streets, Pottstown, PA 19464. Registration begins at 7 a.m. at The Hill School, and the gun goes off at 8 a.m. See the 5K Race page at the July 4th website or download an entry form here. For more information, call 610-970-6607/6608 or 610-970-6618. Preservation Pottstown is also a sponsor of Bike Pottstown, the free bike program run by Tri-County Bicycles at 256 High Street. They are rallying a contingent of bikers for the July 4th Homecoming Parade. Tri-County Cycles has 3o bikes in their fleet, available to the first 30 riders who show up. Kids and adults are encouraged to bike into town or bring their bikes, if you’re from out of town, and meet up at the bike shop around 9:45. From there, all bikers will go together to High and Keim Streets to wait for their turn to join the parade, which starts at 10:15. Bikers will get to see everyone in front of them and, then, when they reach the end of the parade route, they will get to see everyone behind them. Bikers will not miss a thing! So, tape a few streamers to your handlebars, put on your red, white & blue and bike over – I will see you there! I’m sorry, dear readers, I couldn’t hold this in any longer! Here’s what I posted over there this afternoon (as Number5). ” Dear Mercury: thanks for asking! I’ve been thinking about doing a series of blog posts about all these interrelated issues, so I guess this is kind of a jumpstart. Sorry for the length – a lot of pent-up thoughts! And my m.o. is to throw a lot out there and see what resonates on the ground – that’s the spirit in which this is offered. I’m going to stick with the positive spin of the question – suggesting positive changes. What if just about every decision made by town or a local property owner or civic group took that kind of vision into consideration? There are places billing themselves as “sustainable cities.” Maybe Pottstown could be a “sustainable town”? Could something like that provide the framework for guiding revitalization decisions in Pottstown? Pottstown has never been for the faint-of-heart; hard-working, gutsy immigrants made this community what it was in its heyday. Now is no different. Arts and business entrepreneurs, who have higher risk levels than the average Joe, would totally be in keeping with Pottstown’s immigrant past. So, where are these risk-takers? You’ve got a bunch of them in the arts and restaurant community in town already. Another commenter has already mentioned them. Any day now, the Pottstown Arts & Cultural Alliance is going to launch a totally cool new website. PACA is on its way to putting a very new face on outsiders’ perceptions of Pottstown. They are adding value to this community by what they do every day and, now, by more effectively communicating what they offer. And they’re just getting started. The business community and property owners are critical. Bottom line: You gotta fill the spaces on High Street. I’m putting out there right now: If anyone in the business and real estate community wants to put together a clearinghouse website to market their Pottstown properties in an attractive, easy-to-understand format that SELLS, I will gladly help make that happen within, say, 90 days. I’m from out of town and I’ve gone looking for properties as though I were an investor, and it’s not easy to even find out what’s available, let alone where might be some good locations for specific uses like a café or a used bookstore/literary venue or whatever. Community groups: reduce fragmentation wherever possible. Join forces around a common, positive, pro-active vision. Link to and intersect with the arts, business & educational communities wherever appropriate. Good government. There’s no way around this. There has to be a “good government” halo around Boro Hall that can be seen from Routes 422 and 100. Anyone stepping into the building has to know they will be treated courteously, fairly and consistently. There’s got to be follow-through. You got an ordinance on the books, you enforce it. If it doesn’t make sense in your new vision of yourself, you set out on a course of careful, PUBLIC consideration, you ENGAGE the affected parties/property owners, and you change it. The arts, business and community groups can go pretty far if they’re all pulling in the same direction, but unless the foundation of government is strong and inspires confidence, yeah, people are going to be hard-pressed to trust their investments here. By now many readers of this blog have experienced – I hope! – at least one performance at the Tri-County Performing Arts Center at 245 E. High Street in downtown Pottstown. If not, don’t worry – they just keep comin’. Having just put on a widely-acclaimed production of Ragtime, The Musical, they recently announced their Summer Concert Series, which will feature the Jen Chapin Trio on July 16, the Travis Wetzel Trio on July 30 and Maggie and Mark Moliterno and Friends on August 20. The summer camp offers students entering grades 1-12 a chance to explore drama, voice and dance with professional instructors. A new format for middle and high school students allows beginners and more experienced performers to try out one of these areas of concentration or advance their skills, whatever suits their interests or needs. For students in grades 5-12, it’s a full-day program from 9am-4pm. This year Tri-PAC has added concentrations in acting, voice, and dance, so that these older kids can work intensively in one of these areas. A student can still be a beginner and sign up for one of the concentrations and really immerse themselves in it. Half the day is spent in their area of concentration and the other half is spent working to put together an ensemble performance, which will be presented on the last day of each two-week session. For students in 11th and 12th grades (and recent high school graduates) there is also a Counselor-In-Training program. Tri-PAC’s summer camp options continue to evolve to encourage participation in the performing arts by newcomers and experienced students alike. If you’ve got a budding performer in your family, check it out! There is a Student Referral Incentive program and need-based financial aid available. Full information and registration forms are available at http://www.tripac.org. The winners of the gift certificates to Churchill’s are Hildegard W. R. of Boyertown and Mike Holliday of Pottstown — wOOt! Okay, I’m back after 10 days in Vermont at my master’s writing program. Although I LOVED being up there, reading and writing, and talking about reading and writing, and hanging out with readers and writers, I did have pangs of homesickness, including for this blog and this ongoing adventure in community-building. So, to get back into the swing of things and thank my faithful readers, there will be a drawing this Wednesday afternoon for a a couple of $10 gift certificates to Churchill Artisan Baker & Chocolatier. I’ll pick two names on Wednesday from among Positively!Pottstown blog subscribers, Facebook friends and anyone who just sends me an email at positivelypottstown@gmail.com. (Put “Churchill gift certificate” in the subject line.) If you send an email, you won’t be on any list, or subscribed to anything. And I don’t share my lists or email addresses with anyone. 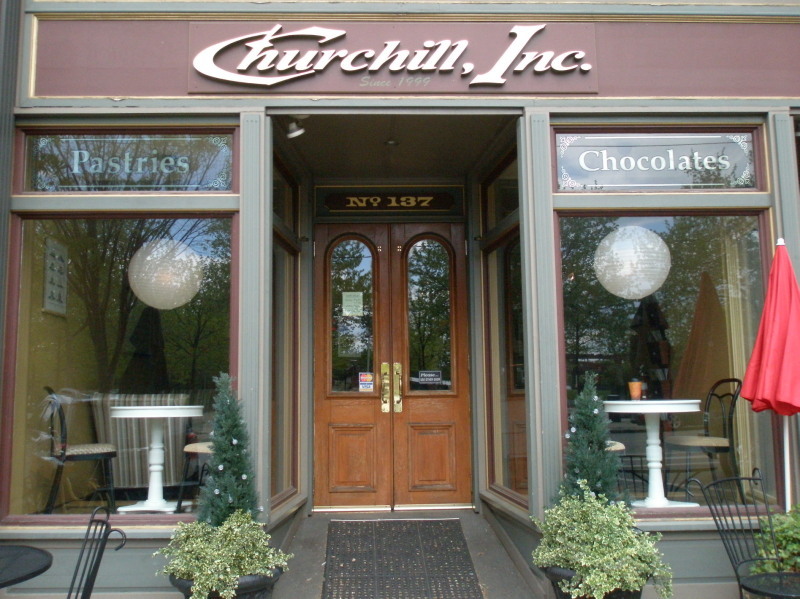 Churchill’s is at 137 High Street, Pottstown, PA 19464, and their number is 484-941-5100. I stop in there just about every time I’m in town and can personally vouch for their great food, coffee drinks and free wireless internet. Plus they’ve got regular poetry and music events on Saturday nights. Spread the word! Yep, you read that title right. And I am of sound and sober mind as I type this. I am a former Homecoming Queen. The year was 1979, and by some fluke or fate or dumb luck, my peers at St. Pius X voted me Queen. It was a surprise and an honor. But then I found myself, the following summer, automatically in the running for the title of Pottstown’s 4th of July Homecoming Queen. I believe the`system in place then is also in place today: if you put a penny into a candidate’s jar in various locations around town, she got another vote. I’ve double-checked my reading glasses and my typing and, no, there are no mistakes in those figures. But that’s just one aspect of the story, albeit a humbling one. I’ll never forget how we were all treated to lunch at Lakeside Inn. And I’ll never forget riding in a convertible down High Street during the parade, perched on the back of the back seat, waving to the crowd. I shared the car with Bernie Diaz, who had been a good friend of mine in grade school at St. Al’s for a short time and who went on to play tennis at Boston College. And the fireworks were incredible. I believe 1980 was the second year of Pottstown’s Fourth of July Homecoming Celebration, which now attracts thousands. Times are tough for people, businesses and government, but I hope we can hold on a little bit longer and find the funds to keep this tradition, one of Pottstown’s finest, going strong. In honor of all those people who put their pennies in for me all those years ago, I’m sending in $64.20. For those of you who plan to come to town to take part in this year’s celebration, or those of you who can’t make it but hold a special memory of Pottstown’s 4th in your heart, please send in a donation now. Pulling together, we can keep it going. Thank you.